Welcome to Main(e) Street (see what I did there? #punny) in my hometown! For this hometown look, I wanted to show what I think is typical Kennebunk style, which is kind of a laid-back, New England preppy look. The blue J. Crew Factory shorts and the anchors on my top (and lobsters on my shoes!) build on the New England feel of the area, and it's a summery and put-together outfit, but without looking overdone. Y'all know that my own personal style is a bit more "out there," but sometimes it's fun to go "back to your roots!" I am also so excited to be wearing styling and reviewing this fun and nifty hat from Cappelli Straworld called the Pack-A-Hat! It has such a cool concept to it- which you can kind of see illustrated in some of these photos! The Pack-A-Hat is the ideal hat for traveling. 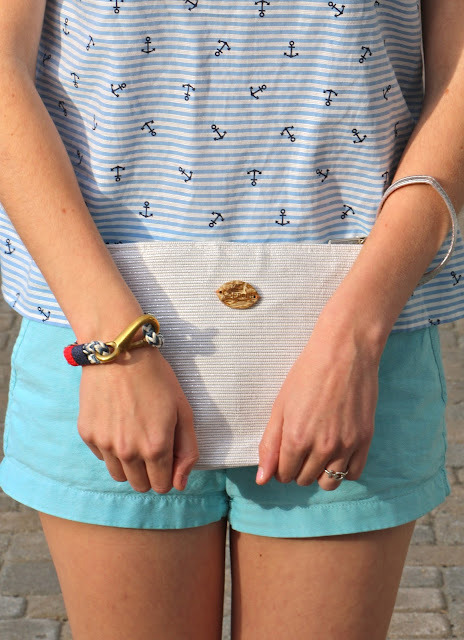 It comes packaged in an adorable clutch (which can also double as a purse on its own! ), and it folds perfectly into the clutch. Then when you're ready to wear your hat, you simply pull it out and unfold it! What a smart invention. The best part is that if you need to take your hat with you in a suitcase or duffle bag for traveling then you don't need to worry about it getting crushed or damaged since it is already packed away! The Pack-A-Hat retails for $25 and can be purchased here! The downtown area of neighboring town of Kennebunkport usually tends to get all of the attention, since Kennebunkport is the more touristy area between the two Kennebunks. But Kennebunk's Main Street is still what I consider to be a quinntessential American small town Main Street area! It is peaceful, well-kept, and filled with a few small businesses, restaurants, and the historic Kennebunk Inn sits right in the middle of it all. Last year, the town bought out a lot the used to house a gas station that had gone out of business. They tore down the building, and instead constructed an outdoor ice skating rink! It is open all winter long, and even equipped for night skating. In the warmer months, this space is used for Farmers' Markets and town festivals. I didn't get any pictures of this new space for this post, but it is just a block or so up from where these pictures were taken! And I had fun trying out the new ice skating rink over this past Christmas break. In other Kennebunks news, Kennebunkport was in national news this week because former First Lady Barbara Bush had her 90th birthday party (and a Bush family reunion!) at the Bush's summer home in Kennebunkport! Christian singers Amy Grant and Michael W. Smith, as well as country singer Reba McIntire were performers at the party. Another interesting party feature was that antique cars were somehow incorporated in... not sure if there was a private car show put on for the Bush family, or if just anyone that owned a certain type of antique car was invited to the party, but during June 7th/8th, there were more antique cars driving through Kennebunkport than newer cars!! Such a fun sight. Anyways, happy birthday Barbara Bush!! I hope that you all have enjoyed the first four weeks of my Southern Belle in the 'Bunk post series, where I have combined my love of fashion and scenic locations for my blog photos, all while wanting to tell you all more about where I am from. I will be taking a break from these posts during the next four weeks while I am studying abroad in France, but Southern Belle in the 'Bunk will return on Friday, July 17! The product reviewed was gifted to me for review purposes on my blog by Cappelli Straworld & Lipton Publicity. All opinions are honest and my own. Well first off let me start by saying that I love puns and your post title definitely made me smile. I've always wanted to go to Maine, and I'm so exciting to follow you in you new blog series, cute outfit by the way!! Having a Pack-A-Hat would come in handy in the summer during wedding season and any outdoor event down here. Kennebunk looks gorgeous and homey. Safe travels to France! It's on my bucket list of places to travel to. Love the little anchor details on the top (such a pretty downtown too)! Aww, I love your outfit! Have so much fun abroad. Looking forward to seeing your adventures. I love your outfit. Your nautical picks are so cute. Have a great trip!!! Pack-a-hat is absolutely brilliant and I need to get myself on ASAP, I'm also loving your combo. Who doesn't love a fun coastal, easy breezy summer look? Have a great time in France! If you fly into CDG airport good luck, there are literally no signs that direct you to anything anywhere. Love this look pretty girl! You look so pretty. So excited to hear about your adventures! Your outfit and the town look super cute! Have fun! Cute way to showcase your New England roots through main st. and your outfit! I love your hair always by the way-it looks so perfect!!! That shirt is so cute! I love the anchors. I can't wait to see more from this series! Love these posts- such a great idea! Wonderful outfit too! Such a cute outfit! Kennebunk looks so cute! You have the cutest little town! Also love your shirt! Love it, and the Pack-a-hat is a great idea. I love the anchor shirt! So cute! I'm in love with you clutch!